One Strike Away...Twice! | It took 40 years to go from lovable losers to Title contenders. Follow along to see if the Rangers can finally seal the deal. Such a bittersweet week. It started with having to say final goodbyes to my mother, who passed peacefully at the ripe age of 97. This prompted a trip to Maryland and, in a case of fortuitous timing, it turned out the Rangers were visiting Baltimore two days after the funeral. This provided me with two great opportunities: a chance to see a game at Camden Yards for the first time and the opportunity to do it with my wife, daughter and two grandchildren in tow! When growing up in Maryland, my first baseball game was a Washington Senators game in old RFK Stadium. But most of my MLB games growing up were Orioles games, viewed at Memorial Stadium. The last time I saw an Orioles game in Baltimore was when my kids were maybe 7 and 5 years old. Now they’re both grown up with children of their own. Despite many trips back to Maryland over the years, a trip to Camden Yards was never in the cards. Until now. 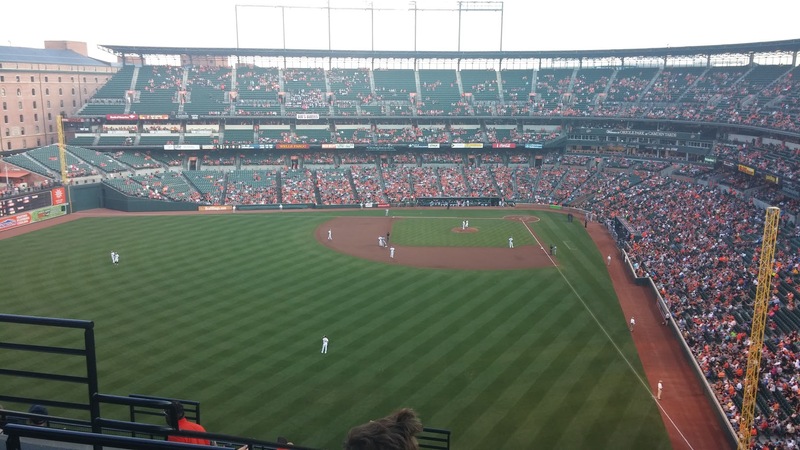 Here’s what I learned: 1) Camden Yards is as nice a place to watch a ballgame as just about anywhere. It immediately made my Top 3 ballparks list, ranking right up there with Globe Life Park in Arlington and Coors Field in Denver; 2) The weather for the game we attended was as perfect as any game I’ve seen: temps in the 70’s, low humidity, little to no wind; 3) One usher in particular was as kind as can be (more later); and 4) watching a game with a 5-year-old and 2 1/2-year-old makes one have to relearn watching a baseball game! I say this because, as excited and happy as I was with the 8-1 Rangers victory, I actually saw very little of the scoring. We arrived just a little late due to Baltimore traffic. We were just getting to our upper deck seats in the top of the 2nd inning when I glanced up just in time to see a ball carom onto the field in right. Mitch Moreland was digging for second and appeared tagged out there. While I was cussing Moreland out (under my breath so the little ones wouldn’t hear), I didn’t realize the umpires were about to call Moreland’s hit a home run. So I kind of missed that one. 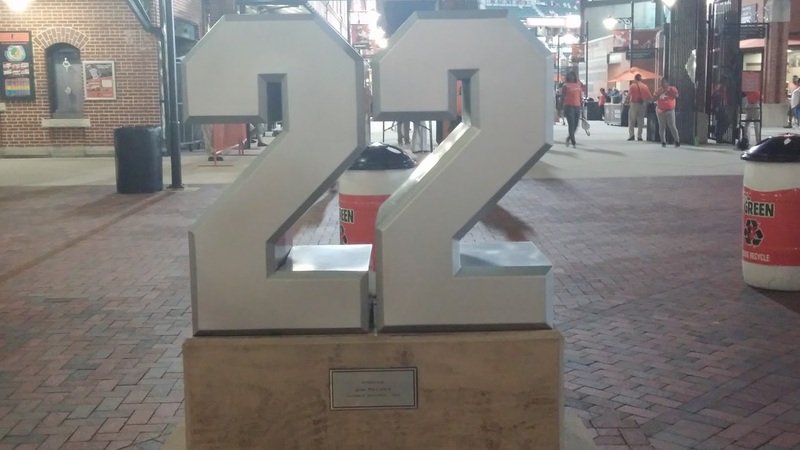 Jim Palmer’s #22 outside the stadium. As the game progressed, I was engaging the oldest grandchild, a precocious 5-year-old named Christopher, in conversation about baseball, school and his favorite things. While looking at him, I suddenly heard the crack of a bat. Carlos Corporan had hit one out. Didn’t see it. An inning or so later, I headed to the concession stands to buy a couple of dogs, some drinks and souvenirs for the kids. While waiting on my lemonade, the cashier announced, “Moreland just hit a 2-run home run.” His second of the game. Didn’t see that one either. But hey, when I returned from the concession stand, I saw the family about 12 rows closer to the front of the upper deck. The usher said nobody was using those seats and invited us to move up. What a nice guy! The game went on. At one point, someone on the Rangers got a hit and I cheered for him. Elizabeth, the 2 1/2 year old, cheered with me. This prompted her older brother, a Baltimore native of course, to admonish her. “You do know you’re cheering for the wrong team, don’t you?”, he scolded. I couldn’t help but smile. In the top of the 5th, Shin-Soo Choo hit a rocket that turned into the Rangers’ 4th home run of the night. This one I was watching but I still didn’t see it. From where we were sitting, the trajectory took it right through the bank of lights in my field of vision. I know it went out and where it went out but I never saw the ball! After the top of the 5th, our friendly usher became even friendlier. “There’s a whole row of seats not being used on the lower level. Why don’t you all go down there?”, he said. Whether he didn’t want to look at my Rangers jersey anymore or he just thought the kids would get a thrill out of the better vantage point (more likely), we jumped at the opportunity and soon found ourselves in the lower deck left field stands, where we stayed until the end of the 6th inning, when the hour dictated it was time to go. Thus, I also missed Joey Gallo’s bases-loaded triple that closed out the scoring for Texas while the little ones were already falling asleep in the car. Eight runs for the Rangers and I pretty much didn’t see the hits that scored any of them. It’s all good, though. Watching a game in a beautiful ballpark on a beautiful night with my beautiful wife, daughter and grandkids made for a spectacular end to what had been a solemn week in my life. I wouldn’t trade a minute of it for anything and honestly, it was one of the best trips to a baseball stadium I’ve had in a long time. It started with Chi Chi and continues with Gobbles. Just a few days ago, the Texas Rangers decided Phil Klein wasn’t the answer for the fifth spot in the Texas rotation. With the Rangers suddenly going from afterthought to Wild Card contender, they also decided Ross Detwiler wouldn’t reclaim the slot when he returns from the disabled list. Instead they went with Alex “Chi Chi” Gonzalez, one of the Rangers’ top prospects. The Rangers really wanted Gonzalez to stay in AAA for all of 2015, with the only possible major league service coming with September call-ups. But the Rangers started winning. And winning some more. Before anyone realized, a 7-14 April record had become a 24-24 record. The offense came alive, hitting home runs with abandon. Suddenly national writers started noticing the Rangers and proclaiming they could be contenders (some of us had a feeling they could be long before this but we’re just homers). With the Rangers surging, the decision came down. Instead of a consistently inconsistent #5 starter like Detwiler, a pitcher with more upside was essential. Gonzalez, it was felt, might take some lumps but he’ll learn from it. And when he’s good, he’ll be better than Detwiler at his best. Gonzalez proved that his first time out. Facing the Red Sox, all he did was spin 5 1/3 hitless innings before David Ortiz laced a double to left center. Ortiz applauded the rookie after he reached second. General Manager Jon Daniels says Gonzalez is not just a couple of starts pitcher. The rotation spot is his to lose, which will make for some interesting times when one of Matt Harrison, Derek Holland or Martin Perez is ready to go. Harrison begins a rehab assignment this week. Meanwhile, Sunday’s breathtaking walk-off win against the Sox got tempered by the loss of Adrian Beltre for 2-3 weeks with a sprained left thumb. Pulling another surprise out of his hat, Daniels announced #1 prospect Joey “Gobbles” Gallo would replace Beltre at third. 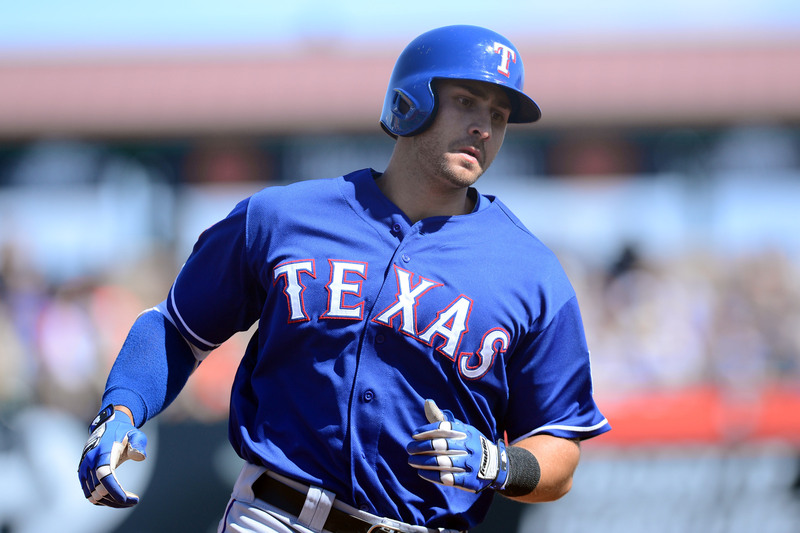 Unlike Gonzalez, Gallo will stay with the Rangers only as long as Beltre is out, then he’ll go to AAA Round Rock. Gallo hits home runs. Lots of them. Majestic shots you won’t forget. I saw him hit one in Corpus Christi a year ago and it was a sight to behold. Gallo has 9 homers this season after hitting 40 each of the past two seasons. He also strikes out a lot and his defense will never be compared to Beltre’s. He does, however, get the chance to experience big league pitching for the next 14 to 21 days. If he hits .400 with 8 home runs in that time span, maybe he won’t go back down. If he does that, it’ll be interesting to see who the odd man out will be. If I had my druthers, I’d put as little pressure on Gallo as possible and bat him 7th in the order, maybe even 8th. Hitting him higher gives manager Jeff Bannister a conundrum. With Beltre gone, Texas could go with 5 lefthanded hitters in a row: Shin-Soo Choo, Prince Fielder, Josh Hamilton, Mitch Moreland and Gallo. Despite the potential power there, it also makes it easier for opposing managers to use their bullpens against the Rangers. No situational lefties here. Get one southpaw and he could go for almost two innings. Put Gallo 7th or 8th and you can split it up just a little. 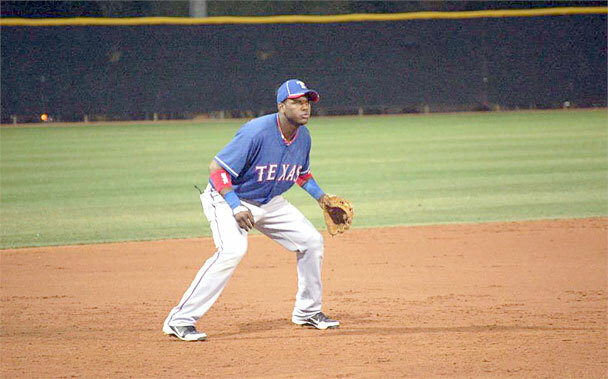 Another fresh face arrived on the scene last week in Hanser Alberto. Alberto is one of the best defensive infielders in the minors of any club but lately, he’s also been hitting a ton for Round Rock. Along with some guy named Josh Hamilton, Alberto’s impact on Texas was immediate, hitting .364 in his first three games with a triple and 3 RBI. The new generation of Rangers is coming and there are more on the way. This team may be getting ready for another good 3-4 year run. Hard to believe, the season is already at the 25% mark. 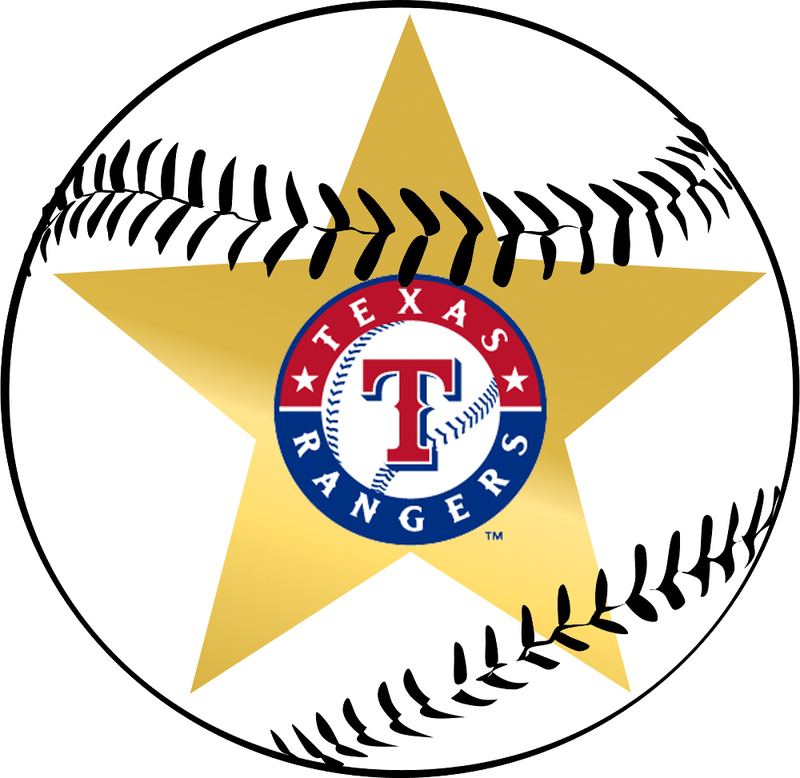 The Texas Rangers finished the first quarter of the season a lackluster 18-23 at the quarter pole but, considering the season started at 8-16, it’s not horrible. Horrible would be the team behind the Rangers in the standings, the Oakland A’s, who are a full five games behind Texas, which sits in fourth, a half game out of third. At the end of April, the Rangers’ report card reflected a totally awful offense. The first quarter report card has improved. 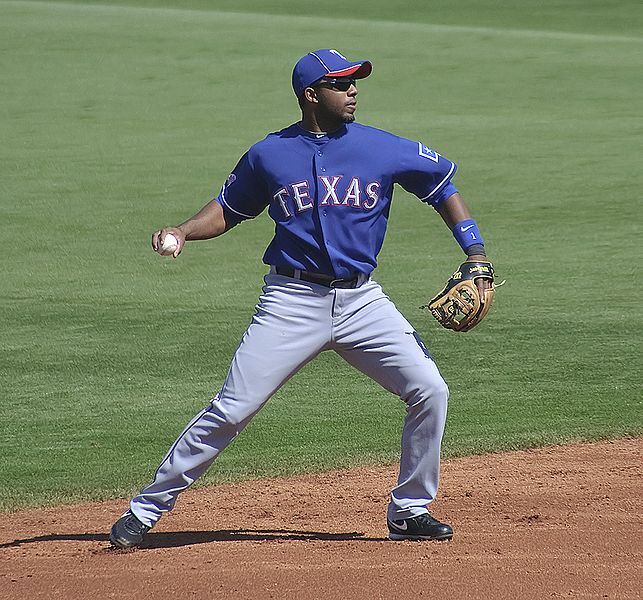 There is no bigger surprise than the play of Rule 5 pick Delino DeShields. The expectation for Double D, who hit only .236 for AA Corpus Christi last season, was, at best, being the 24th guy on the 25-man team, serving primarily as a late inning pinch runner and defensive replacement. 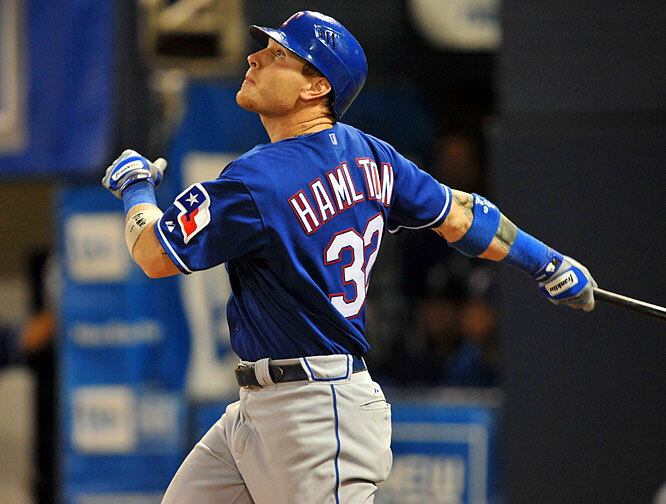 Instead, he’s putting pressure on the Rangers to find a place for him in the line-up every day once Josh Hamilton arrives. DeShields leads the club in steals with 10. He’s actually tied with Adrian Beltre for first on the team in WAR at 0.9. He leads all Rangers regulars in pitches seen per at bat at 4.09 (Tommy Field is better but only has 9 games under his belt). When Hamilton joins the roster, DeShields could find himself in a CF platoon with Leonys Martin as well as a 2B platoon with Field. While he has an impressive track record, nobody thought Prince Fielder would be as good as he’s been thus far. Fielder’s hitting for average, he’s hitting for power, he’s been the steadiest hitter all season. Facing a shift just about every day, Prince has learned to hit against it, going the opposite way many a time. He leads the AL in multiple hit games. And, as mentioned earlier, he manned up and became the primary DH because he saw that Mitch Moreland’s D gives the team a better chance to win. On the pitching front, Colby Lewis, Nick Martinez and Keone Kela all get nods. Lewis has possibly been even better than he was in the Rangers’ World Series years. Usually one of the league leaders in home runs allowed, he’s only given up three in 8 starts. In 50 innings he has 41 K’s, outstanding for a pitcher whose fastball seldom tops 90 on the radar guns. All this on a resurfaced hip. Colby pitched in pain for years. Now he probably wishes he’d done the procedure sooner. 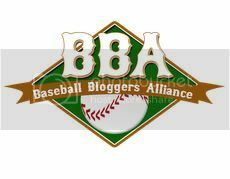 Martinez was hands down the AL’s best pitcher in April, posting a sub 1.00 ERA. He’s struggled in his last few starts but still sports a 3-0 record with a 1.88 ERA. Pretty good for a guy who had never pitched above AA when forced into the Rangers plans a year ago. Martinez was below average a year ago, expected considering his situation, but posted a sub-3.00 ERA in 5 September starts. Seeing his success roll over to 2015 is great. Keone Kela is a rookie who’s performed well in every role the Rangers have given him this year. He’s been used in long relief, short relief, in the middle of games and in high leverage late inning situations. Through it all, he’s put up a 3-1 record, 2.25 ERA and 19 strikeouts in 20 innings. Only 22 years old, Kela is already thought of as a future closer in another year or two. With three-fourths of the season still ahead, everyone has time to improve back to expected levels. Still, two of the biggest disappointments are infielders. Everyone had high hopes for second baseman Rougned Odor following a rookie campaign in which the 21-year-old hit a respectable .259 with 9 home runs and 48 RBI. This writer projected Odor for about .270 this season with 14 home runs and 70 RBI. Instead, he laid a big egg. The league adjusted to Odor and he didn’t adjust back. With a .144 average after 29 games, Texas sent Odor to AAA Round Rock to get his game back. He’ll likely be back no later than the All-Star break (and already has 3 Home Runs for the Express) but nobody expected him to get sent down either, so who knows? Meanwhile, his teammate Elvis Andrus has everyone worried. Never a great hitter, Elvis is regressing so far again this year, checking in at this writing at .224 with a homer and 11 RBI. After spending most of his career as the #2 hitter in the line-up, Andrus shows up at #6 more often than not these days. Once he’s on base, he only has 5 steals in 8 eight attempts. This would all be acceptable if he played defense the way he’s known to, but even that is regressing. Elvis has nine errors in the season’s first 41 games and should have gotten tagged with his 10th in a game against the Red Sox this week. Put it all together and you have a MINUS 0.5 WAR. That’s right, Elvis is now considered a BELOW REPLACEMENT LEVEL player! This from a guy who averaged over 4 WAR from 2011 to 2013. Oh yeah and a new long-term contract just kicked in this year. The only thing saving Elvis right now is the Rangers feeling they don’t have an everyday shortstop down on the farm. I think the problem is mental. In the World Series years, the Rangers were full of leaders and Elvis could just enjoy playing baseball. Now he’s a veteran and maybe expected to do more and he’s letting it get to him. If he doesn’t hit, fine. But Elvis, you’ve got to get your D back! On the pitching side, I could say Neftali Feliz is a disappointment but he’s never regained his velocity since Tommy John surgery. For me, the biggest pitching disappointment is Yovani Gallardo. Sure, he’s a bit removed from his days fronting the Brewers rotation. But I didn’t expect him to have so many command issues. Gallardo is 3-6 with a somewhat respectable 4.26 ERA but it seems every start is a struggle for him. I’ve gotten used to Eric Nadel describing the action on the radio and hearing an opposing batter has worked the count to 3-2 on Gallardo. He’s only allowed 15 walks but every batter feels like a long battle. While he’s not a heat thrower, Gallardo is reminding me of Rich Harden in 2010, where you just prayed the at bat would end soon. He’s averaging less than 6 innings a start and he’s the guy who’s needed as the “ace” with Holland and Darvish out. When acquired, Gallardo got pencilled in as the #3 starter. He’s pitched like more of a #4 than the #1 or 2 results the Rangers need from him now. Words to the effect of today’s headline are often used on Twitter as a crude laugh while also drawing attention to a sad fact of life for the baseball team. It is, in fact, a fitting description of the Texas Rangers bullpen. Weak may even be an understatement. In April, there was much consternation over the lack of punch in the Rangers offensive attack. As we approach the end of the season’s second month, we find the Texas offense is actually not too shabby and may soon improve further with the arrival of Josh Hamilton. Sadly, outside of a brief four game winning streak, the results in wins and losses haven’t improved appreciably and the bullpen carries a lion’s share of the blame. Through May 16th, the Rangers bullpen was carrying an anemic 6 plus ERA for the month. For the season, the Texas relief corps has more blown saves than saves. In Saturday’s loss to the Cleveland Indians, the relief staff managed two blown saves in the same game. The bullpen is now in flux. Neftali Feliz, while still officially the closer, did not close out Sunday’s 5-1 win over the Tribe, Shawn Tolleson did. After just two appearances, Kyuji Fukikawa got released. The same fate earlier befell Stolmy Pimentel and Logan Verrett. Spencer Patton has come and gone, as has Jon Edwards. The newest additions to the pen are Tanner Scheppers, who started the season ineffectively in Arlington, and Ross Ohlendorf, who Sunday made his first big league appearance in two years. If the latter two prove effective, it provides Texas a potent late inning triumvirate. What would still be missing, though, is a closer. If Feliz can’t hold down the job, and his last few outings have shown that as a distinct possibility, there is no proven option to replace him. Plenty of teams have caught lightning in a bottle with an unknown closer coming out of nowhere. The Rangers haven’t had a lot of success in that area, with one notable exception: Neftali Feliz in 2010. 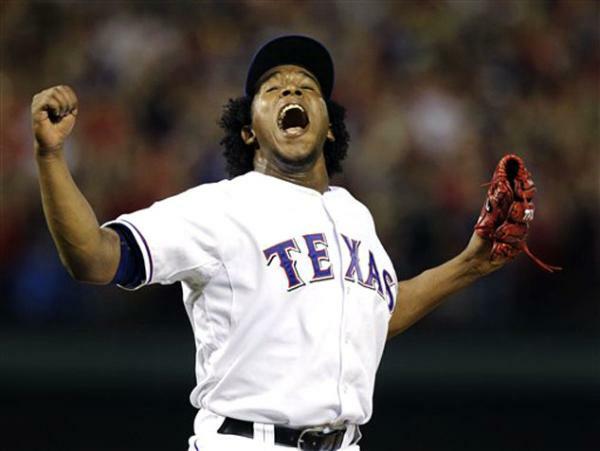 Five years ago, Feliz unseated Frank Francisco and helped lead the Rangers to their first World Series. Five years later, Feliz may soon suffer the same fate as Francisco. The Texas offense is recovering. Now it’s the bullpen’s turn. If they don’t turn it around, all the offense in the world won’t help the Rangers. The Texas Rangers find themselves in last place in the AL West, a familiar perch since 2014. Yet scoring back to back wins for the first time in 2015, over the first place Houston Astros no less, adds more good problems to the Rangers. Here are the problems, in order of when they’ll crop up. Before an elbow issue forced him to the DL, Moreland was one of only two bright spots in the Texas offensive lineup, hitting .304 with a homer and 9 RBI in 16 games. 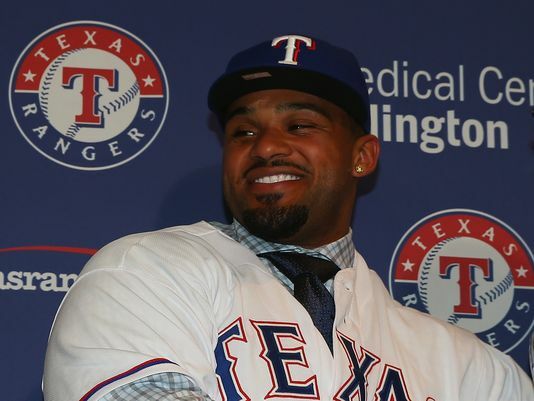 Prince Fielder even agreed to DH more because he saw Mitch was the better defensive 1st baseman. The problem is the guy Texas brought up to replace him. Kyle Blanks, picked up on waivers from Oakland in the off season, has been nothing short of sensational. In his first six games, Blanks is hitting at a robust .391 clip, with 3 home runs and 5 RBI. Blanks can play left field, so when Moreland is ready for activation, the Rangers could move Blanks there. That, however, brings up Good Problem #2. Assuming Moreland returns to 1st base/DH duties, Blanks gets moved to left field, leaving no spot for Carlos Peguero. 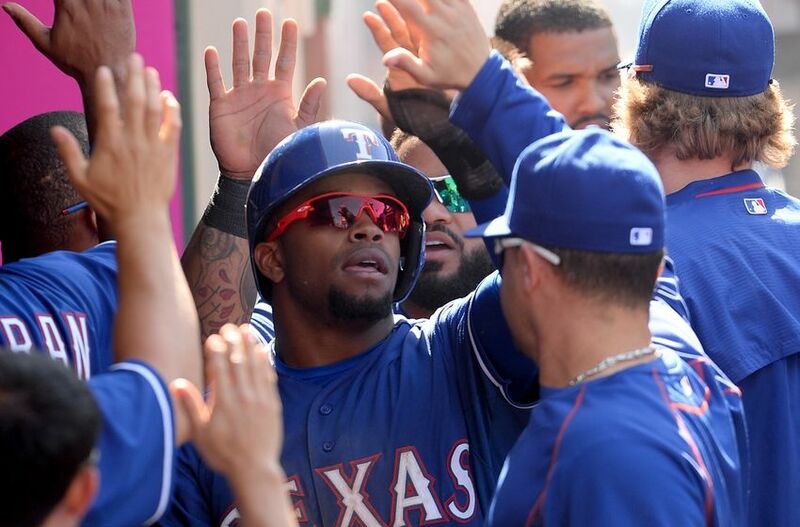 Now what happens when Josh Hamilton is deemed ready to go? If Blanks continues his hot hitting, you don’t get rid of him. It appears the only choices would be releasing Jake Smolinski, who manager Jeff Bannister loves for his hustle, or offer Rule 5 pick Delino DeShields back to the Astros. DeShields offers speed on the bases. While Smolinski is probably the better player overall, DeShields might have more worth to the team. I fear Jake will be out of a job soon. This brings us to the Good Pitching Problems. Oof. Now it gets dicey. Perez is returning from Tommy John surgery, Harrison from back surgery. There’s no guarantee Harrison comes back but signs thus far is positive. Perez should be ready after the All Star break. If both come back, then what? Colby Lewis and Martinez have been the best starters, Wandy Rodriguez has done well so far and Yovani Gallardo is who he is. A quality piece or two will have t p go. Since Perez still has options available, if I’m the Rangers, I just might let Perez spend the rest of the season in Round Rock. Then he’ll be more than ready for 2016. A successful Harrison return means someone has to go. If the Rangers aren’t in the pennant chase, I think Gallardo is traded for a prospect or two. Lots of problems, but these are good ones to have for a change. It could change rapidly but the big league sophomore has been the Rangers’ best pitcher, starter or reliever. Martinez has gone seven innings in each of his first two starts and has yet to surrender an earned run in getting off to a 2-0 start. 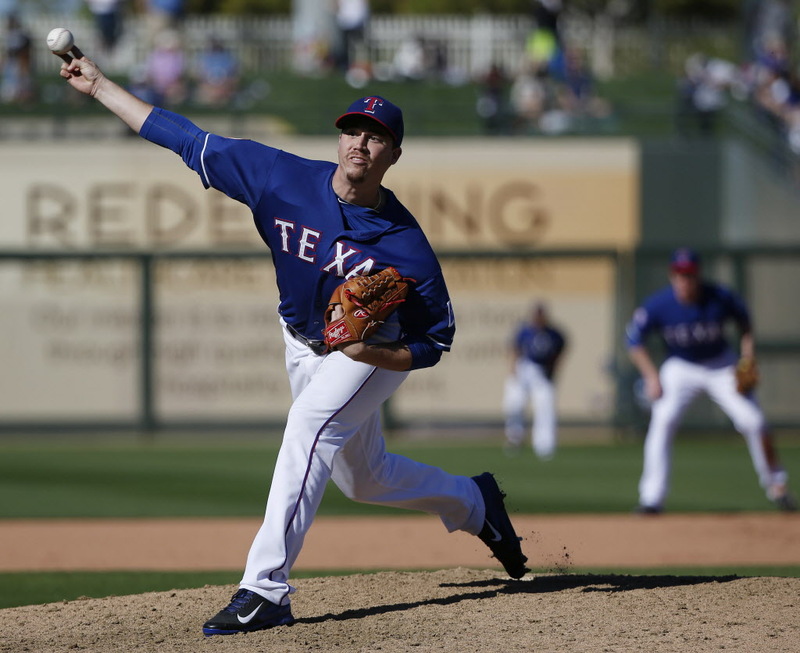 Without Martinez, the Rangers pitching staff would be lowly indeed. Colby Lewis has been OK, Yovani Gallardo slightly below average and Ross Detwiler abysmal to the point you’d be hard-pressed to find a single Rangers fan in favor of letting him make another start ever. On top of that, no sooner had fans resigned themselves to being without Yu Darvish for the year then the new expected ace, Derek Holland went down for two months with a shoulder issue. Anthony Renaudo wasn’t the answer in one start. The chorus of fans singing for promoting Chi Chi Gonzalez is growing. Despite bright spots like Anthony Bass in long relief and Shawn Tolleson in the 7th inning, nobody else in the pen is rising to the challenge. Nowhere was that more evident than Sunday’s gut-wrenching 11-10 loss to the Seattle Mariners. Tanner Scheppers, in his second game back from the DL, couldn’t find the strike zone in the 8th, walking the bases full. Rookie Keone Kela, seen by many as the heir apparent for the closer’s role, showed he’s not ready for prime time, walking in one of the runs after relieving Scheppers. Closer Neftali Feliz was forced to try to get a 5-out save and couldn’t get the job done, giving up a 2-run single in the 8th, then two more runs in the 9th to blow the save and get the loss. The Rangers firemen have acted more like arsonists. The big guy doesn’t have a single home run and leads the AL in singles of all things. He’s also been the Rangers’ steadiest hitter. He’s beating the shift by going the opposite way, which is why he’s getting a lot of singles. He’ll eventually get the power stroke going but it’s going to require Adrian Beltre and Shin-Soo Choo to start hitting the way they can. Fielder won’t see better pitches until the guys hitting behind him start giving pitchers something else to think about. 2014 was a record-setting injury year for the Rangers and 2015 isn’t starting much better. Derek Holland is out for two months, left fielder Ryan Rua sprained his ankle, then discovered he has a stress fracture in his foot, which will keep him out for a while. Choo and Mitch Moreland have missed games already with minor ailments, Scheppers just returned from the DL. Texas is a slightly deeper team than they were a year ago but can still ill-afford many more injuries. What’s happened to Elvis Andrus? Never a scary offensive presence, now his defense seems to have regressed. Elvis makes his living being a brilliant defender first, a decent running threat second. Thus far, he’s not hitting, he’s not running and he’s not fielding. As of yesterday, he was the lowest rated position player by WAR in baseball. This HAS to improve. The season is not off to a good start. Texas is once again resembling a last place team. They will hit better. There are too many pieces with good track records who have started out slowly. Pitching is another issue altogether. The Rangers need more innings from their starters and a couple more bullpen pitchers to step up. Otherwise it’ll be another long year in Arlington.